The arrival of Brazil as one of the world’s fastest growing economies has allowed the language of the nation, Portuguese to become one of the most important in the world. The language is the sixth-most spoken in the world and the fifth-most used on the internet with a range of websites using the language as their primary choice. One of the most interesting things to consider when deciding on the best way to learn Azorean Portuguese is the fact the language is spoken on three continents and by millions of people. Azorean Portuguese is no different from the language spoken in Portugal, Brazil, East Timor, and Mozambique apart from a few regional variations. There are many different options open to you if you are looking for a fast and efficient way of learning Portuguese from the comfort of your own home. What is the best way of learning Azorean Portuguese? The answer should be simple and take in a few easy steps to get you on the road to understanding Portuguese for whatever motivation you have. Finding a website offering a range of simple to understand words, numbers, and phrases is the best starting point for any individual looking to get the best from their language learning objectives. When looking for a website capable of providing the best in Portuguese learning it is a necessity to source a link offering audio solutions to your learning needs. By working with a website offering audio options one can work through different phrases, words, and numbers with the opportunity to make the correct sounds when identifying a phrase. By allowing the individual to memorize the different phrases which can be easily understood the student should take these into their everyday life. When living and working as one does, every time a number is used the Portuguese pronunciation should be stated to push the words further into the mind of the individual. If you are determined to make the most of your learning objectives in Azorean Portuguese, you can set out to take the first step by carrying a Portuguese to English pocket dictionary. Another option is to download a translation app which can take the place of the dictionary when looking to translate everyday words. By constantly looking to bring your learning environment into your everyday life you will enrich your vocabulary quickly and efficiently. Of all the languages in the world, you may question why an individual would decide to learn Portuguese. However, looking solely at the history and culture of the nations using Portuguese as a primary language shows the amazing range of learning opportunities there are. The history of Portugal itself is an interesting one and inspires many people to explore the opportunities for enjoying speaking the language used by one of the oldest nations in Europe. In the 8th-century, the Moors of North Africa crossed the ocean to make their way to the Iberian Penninsula which today forms the majority of Spain and Portugal. The largely Muslim population of the Moors conquered most of Portugal and made the nation a melting pot of cultures from across Europe and Africa. 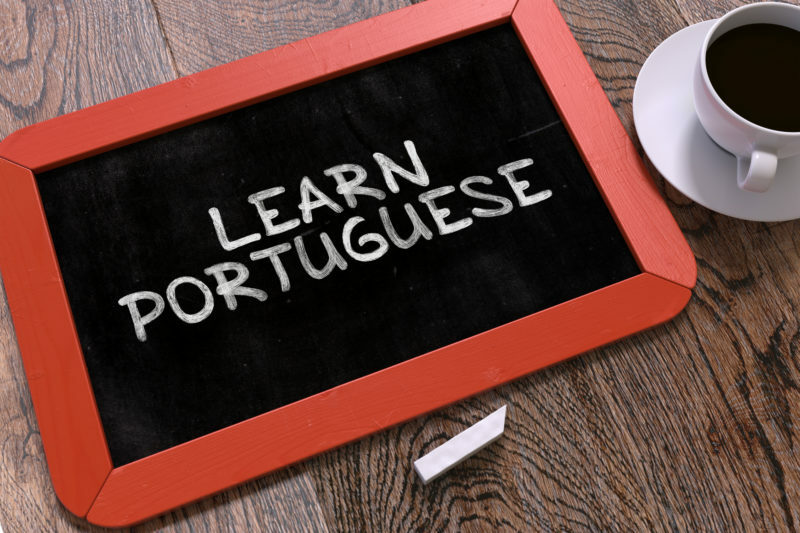 Understanding Portuguese allows the learner to step back in time and learn about the history of one of the world’s oldest and most diverse cultures. The classic Portuguese language is one of the oldest and most impressive in the world but has recently been enjoying a surge in popularity. So, why is Portuguese enjoying its current resurgence as an international language? The short answer is the developing economy of Brazil has given the language a boost as the nation becomes one of the most impressive economies on the planet after decades of weak performances. The nation of Brazil has played a key role in the development of Portuguese over the centuries since it became a colony of the Portuguese. A series of trade deals have been brokered by the Brazilian government with China and other nations meaning the language is becoming one of the most important for international business leaders. When you set out to become an experienced and impressive Portuguese speaker, you will need to remain motivated at all times to stay ahead of the game in terms of keeping your mind on learning. In the first instance, the primary motivation for learning Portuguese can be used to guide learning with a focus on the words and phrases needed to understand a particular aspect of life and culture. From there, the love of the language and culture is sure to develop with more of a focus on the areas of life the individual learner can enjoy and explore for their future learning objectives. For example, a student may be attracted to the Portuguese language because of their love for the soccer players and teams of Brazil. In this instance, the learner has the chance to learn the key phrases and words associated with soccer and build an initial base of the language they can build upon in the future. Another learner may be looking to discover the language as they are planning a trip to the Rio Carnival or hope to enjoy a trip to Portugal and the Iberian Penninsula. Most languages have a distinct feature one can focus upon as you explore the different options open to learners. Portuguese can be tricky when first learning the language as it has two key characteristics which must be learned in different ways. The language is poetic and melodic while also maintaining a nasal sound that can be difficult for a native-English speaker to imitate. The best way to learn Azorean Portuguese is to biuld a database of words and phrases to be used on a regular basis. Brazilian speakers understand which words to place the emphasis of a sentence on and which words are to be said in the nasal or melodic way. One of the easiest ways of identifying which way to say a specific word is to look for the small symbol above the “o” and “a” of a word. The tilde is used to signify which way a word should be stressed during a sentence and provides a great way of knowing where the stress or melodic aspects of the language are to be found. As a learner continues to work through their own jungle of the Portuguese language they will find they are navigating a beautiful, classical language which has many benefits and reasons to continue learning even after the initial goals have been achieved.